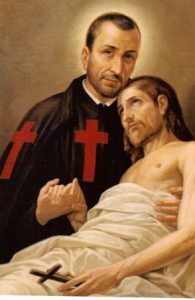 The St. Camillus Society here at Sacred Heart is a group of Extraordinary Ministers who dedicate their time to taking the Holy Eucharist to the sick and shut-ins of our Parish. Whether it is weekly, monthly or quarterly, these individuals visit our infirmed to ensure that their spiritual needs are being met and to let them know we are praying for them. Do you know someone who is home-bound and would like to receive the Holy Eucharist? Thinking this might be a way for you to provide ministry in your community? We would love to hear from you or have you join the Saint Camillus Society. Please contact our Director of Religious Education at 304-346-9369 for more information or to become a member. Camillus de Lellis was born at Bucchianico, Abruzzo, 1550; died at Rome, 14 July, 1614. He was the son of an officer who had served both in the Neapolitan and French armies. His mother died when he was a child, and he grew up absolutely neglected. When still a youth he became a soldier in the service of Venice and afterwards of Naples, until 1574, when his regiment was disbanded. While in the service he became a confirmed gambler, and in consequence of his losses at play was at times reduced to a condition of destitution. The kindness of a Franciscan friar induced him to apply for admission to that order, but he was refused. He then betook himself to Rome, where he obtained employment in the Hospital for Incurables. He was prompted to go there chiefly by the hope of a cure of abscesses in both his feet from which he had been long suffering. He was dismissed from the hospital on account of his quarrelsome disposition and his passion for gambling. He again became a Venetian soldier, and took part in the campaign against the Turks in 1569. After the war he was employed by the Capuchins at Manfredonia on a new building which they were erecting. His old gambling habit still pursued him, until a discourse of the guardian of the convent so startled him that he determined to reform. He was admitted to the order as a lay brother, but was soon dismissed on account of his infirmity. He betook himself again to Rome, where he entered the hospital in which he had previously been, and after a temporary cure of his ailment became a nurse, and winning the admiration of the institution by his piety and prudence, he was appointed director of the hospital.